Health Professionals spend much of their time identifying and then eliminating the causes of pain, thus providing relief for the patient. In most cases this approach is successful and the patient is relieved of a most stressful situation. Even though pain is a very necessary warning signal of a disorder of the body or mind, it is nonetheless stressful to the person experiencing it. It is the most demanding of all symptoms. The patient wants immediate relief, and the doctor, sensing this urgency, finds himself stressed as well. If the pain process is short-lived the patient’s reaction is generally limited to the physiological and psychological consequences of anxiety and fear. Since the process is of short duration, major problems seldom develop. This type of pain is generally referred to as acute pain. Simple pain is a much better term to use for pain of short duration because it suggests that complications seldom develop. Using the same reasoning, pain of longer duration, formerly referred to as chronic pain, is better called complicated pain. The complications referred to are the reactions to prolonged stress. These reactions increase in number and in intensity the longer the pain persists. As these complications continue they reduce the individual’s tolerance to pain, thus increasing his perception of pain and in turn, his distress from it. To give optimal care to the patient who is experiencing pain, the doctor not only must attempt to find the cause of the pain and eliminate it, but he must also help the patient manage the reaction to stress which accompanies this pain process. The intensity of the physician’s reaction will be directly related to the intensity of the stress as he perceives it. The most important aspect to remember is that it is the patient’s perception of stress and not the doctor’s which is at issue. Doctors frequently forget that the patient may be going through this experience for the first time, even though the physicians may have observed this experience many times in their practice. Whether the stress reaction is mild or severe it always takes the same course, varying only in degree. Change from the traditional and familiar to the new and unfamiliar is the common denominator of the stress reaction. The initial stage is a superficial, stopgap measure to protect the individual from a new unfamiliar event. Denial and bargaining become the initial line of defense. Denial is the attempt to eliminate the problem by pretending it doesn’t exist. At this stage, the patient, does not admit to himself or others that he feels threatened by the symptom. He therefore does nothing physically or psychologically about it. He either will take no action to seek help or if he does contact his doctor he will tend to minimize the importance of the situation. The value of denial is that it allows the patient a brief period of time to become familiar with a new situation so that appropriate action can be taken. Denial only becomes pathological if it continues, thus preventing the patient from progressing through the stress reaction to completion, and if it persists, the doctor may become confused because the repressed anxiety increases the intensity of the patient’s pain by lowering his pain tolerance. The patient, in a very demanding way, complains loudly of the pain, but shows very little personal distress. The doctor, confused by this attitude, refers to the patient as neurotic, malingering or hysterical. In reality the patient is going through a normal stress reaction and has become fixated in the first stage. The doctor can help the patient to move on from this stage by insisting that they talk about the real feelings of anxiety and fear that must be present. Bargaining, the other process that occurs in the initial superficial response to stress, is the attempt to undo what has happened. The magical thinking of the child’s mind, which we all carry into adulthood, is called into play during this phase. A child believes the thought is the same as the act. Patients in this stage will often use the phrase, “if only” because they are attempting to undo the stress. For example, the dental patient might say, “if only I flossed regularly as my hygienist suggested.” This attempt to “undo” becomes pathological if it prevents the patient from doing something effective about the stressful situation. “Doctor shopping” is a common behavior pattern of people in this stage of the stress reaction. 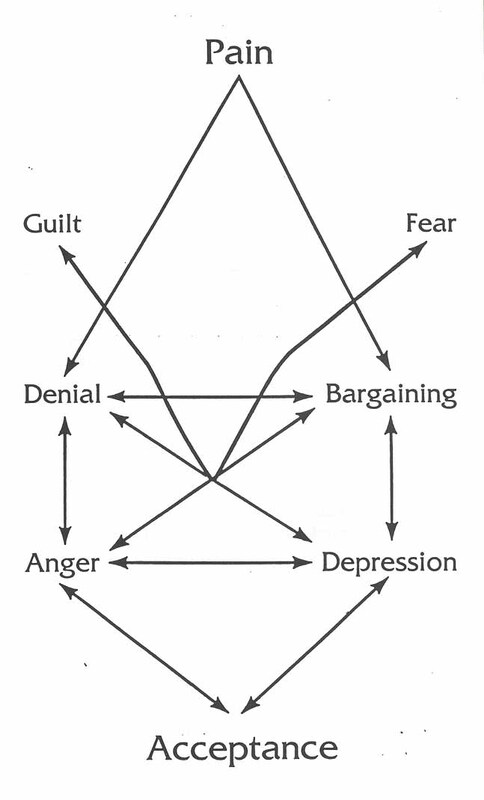 The next stages of the stress reaction are anger and depression. These are referred to as the deeper levels of defense. Anger, by definition, is a state of tension and hostility directed against one who inflicts a real or supposed wrong, as when an expectation is unfulfilled or a goal is not achieved. When a patient experiences pain, the expectation is that the doctor can remove the pain. If this is frustrated, anger obviously results. Anger is a normal response to stress, be it pain, change or loss. Unfortunately, most people were taught early in life to repress anger, especially toward authority, because the accompanying behavior was not acceptable. Doctors in our society are seen as authority figures. Anger has more energy than any other feeling. When it is repressed the energy builds up and eventually produces depression or physiological responses such as muscle tension. Some of the anger may escape the repression and be expressed indirectly by teasing, joking and martyrdom. Another common method of indirectly dealing with anger is referred to as passive-aggressive behavior in which the person does nothing or does the opposite of what is expected. Even some direct methods of expressing anger are destructive, such as blaming others, revenge, or self-blame. Revenge is a particularly destructive method of dealing with anger because it has a two4old effect. The patient suffers internally as he ruminates about his feeling and then later causes suffering to others when he directs the full force of his anger outward. In our present day society, litigation has become a socially acceptable way to seek revenge because it is supported and encouraged by our legal system. Depression, which is felt as a loss of interest, occurs when anger is repressed. This symptom lowers pain tolerance more effectively than any other factor. With this lowered pain tolerance, the person’s perception of pain increases. The doctor now becomes confused and often angry because the patient’s complaints of pain far outweigh the organic findings. If the doctor becomes too frustrated by this experience he may attack or reject the patient whom he sees as a neurotic, and with this attack, the patient either responds with anger or hurt. Added to the depression, this further lowers his tolerance to pain. An additional breakdown in the doctor-patient relationship occurs when the patient perceives the doctor as a GodAike individual who can always produce what the patient wants. Paralleling this, the doctor’s expectations of the patient are frequently frustrated because he expects the patient to recover when treated. In the proper management of the stress reaction to pain (or to any other illness; for that matter), the patient needs an opportunity to express his anger and frustration over what he is experiencing. The doctor who can present himself as an understanding and accepting authority is the best individual to encourage the patient to release these feelings. Patients who are allowed to talk about these feelings to an understanding listener can generally rid themselves of distress in a few minutes and move on to the next stage in a stress reaction without experiencing depression. The stress reaction is resolved when the stage of acceptance is reached. At this point the patient no longer denies what has happened, is not trying to undo the process, and for all practical purposes is ready to face reality and not wallow in anger, frustration, guilt, self-pity and depression. He cooperates fully with the doctor by putting his energy into whatever treatment modality is indicated. If the pain process cannot be eliminated, and the person must learn to cope with pain, he can accept the situation and work on methods to raise his pain tolerance. In the past, drug addiction from prescribed narcotics was all the physician had to offer patients with chronic pain. Now, with the understanding of chronic pain, the doctor can offer the individual an active productive life. Pain is not a disability, only the reaction to pain may be disabling. Loran F. Pilling, M.D. / Vernon D. Gray, M.D.